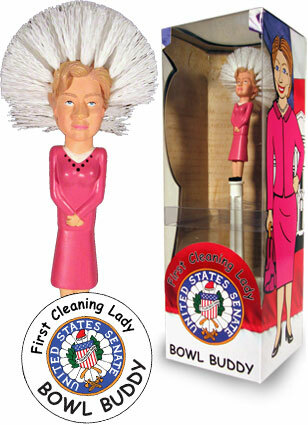 So, my first reaction to discovering the Hillary Clinton toilet bowl brush ("First Cleaning Lady") was to denounce it for obvious sexist offenses. I considered the inherent suggestiveness of domestic roles, and “the man” keeping us down by yet again realigning women with household duties instead of, say, running for president. What nerve!, I thought, and immediately started writing this blog in my head. Then, I visited the Web site and discovered a couple more gems: George Bush as Head of State and Osama Bin-Scrubbin'. Foot: Meet my mouth.